Titanium is named after the powerful Titans of Greek mythology, because of its great strength. It’s also light, doesn’t corrode, and bends without breaking. Those properties make it a strategic raw material for many products, including aeroplane body parts, missiles, spacecraft and defence armour. The problem is that it is not easy to buy titanium in Europe or recycle unused scraps economically. Big firms like Airbus often look to the US or Russia when they need to buy titanium or recycle scraps. 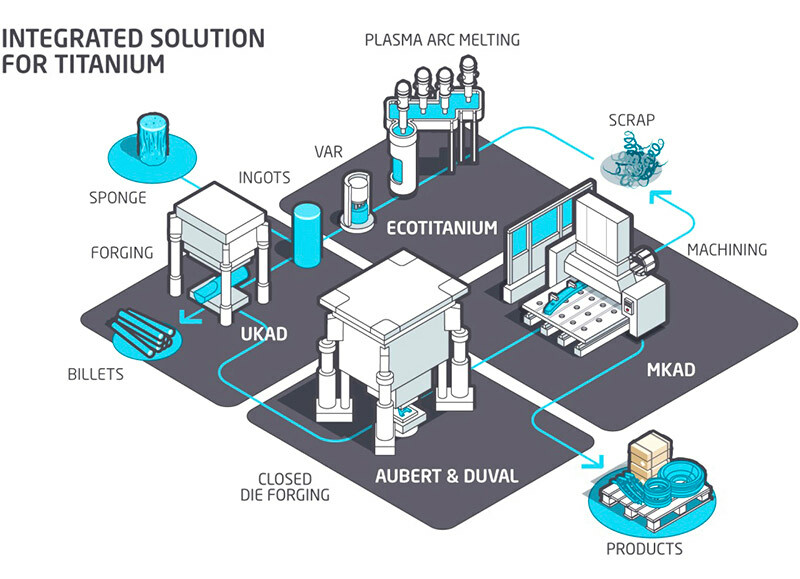 Now a new French factory called EcoTitanium is solving this problem by using advanced furnaces and other technology to recycle titanium. The process also helps the environment by reducing emissions, because recycling titanium uses less energy than refining titanium ore.
“Titanium is a valuable metal and we are going to dramatically improve the supply of it,” says Thomas Devedjian, chief financial officer at Eramet, the mining and metals group that built EcoTitanium in the volcanic region of central France. EcoTitanium uses the latest technology in plasma and vacuum furnaces that consume less energy than other melting methods. A plasma furnace melts substances with heated gas, while a vacuum furnace melts with the absence of air to prevent contamination. Titanium requires special melting devices because it is so resistant to heat. Titanium is not rare, but it is costly because it is hard to refine. Its production involves a lot of labour and extreme heat. It is six times more expensive to produce than steel. The machining of titanium creates a lot of scrap titanium that is often sent outside Europe for reuse. For some plane parts, 90% of titanium ends up as manufacturing scrap.The new recycling plant, in Saint-Georges-de-Mons, will turn out aviation-grade titanium alloy that is a little cheaper than new titanium and less wasteful. The plant will avert the emission of 100,000 tonnes of carbon dioxide a year. Europe needs this type of innovation,” says Mariateresa Di Giacomo, a senior loan officer at the European Investment Bank. Titanium is also used in hulls of ships, bicycle frames and in the chemicals industry. It connects well with bone, so it is found in dental implants and prostheses. Titanium dioxide, the material used to refine titanium metal, is an excellent whitener for paint, sunscreen and toothpaste.